Hello, and welcome to Spacemon, the tale of my Pokemon TRPG campaign played using the Pokemon Tabletop United (PTU) System! Here you will find the complete collection of chapters in Volume 2! If you’ve read Volume 1 and want to keep going, this is the place for you! 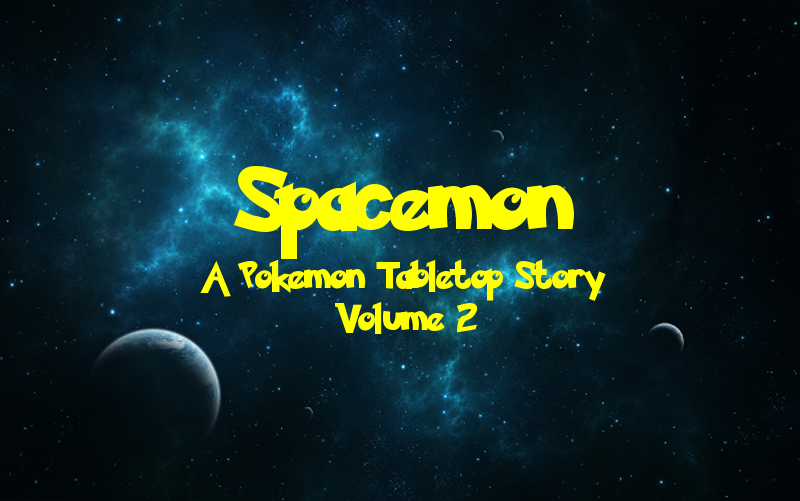 Spacemon is a science fiction space epic set in a Pokemon universe imagined up by GM and fellow TAY author DragonStorm247. The sessions in Volume 2 were from January 2015 through April 2015 and the posts were posted concurrently on a weekly basis. Now, I present to you Volume 2 of Spacemon! Chapter 14: Battle for the Belt! Finished reading all of Volume 2? Then be sure to check out everything else related to Spacemon! Want more of the story? Check out Volume 1 and Volume 3. You can also find every post related to Spacemon here! And finally, be sure to check out the Spacemon Appendix for more insight into the world and characters of Spacemon (Spoiler warning if you haven’t finished the series)!